ubuntux and laptop are the hostnames (names) of the computers that can be used to identify them in the LAN. For example if you want to ping ubuntux you don’t have to know its IP. You can just ping the computer by providing its hostname. Keep in mind that hostnames cannot be seen outside the LAN. If you don’t know the hostname of your computer you can run in the terminal the command hostname. Throughout the tutorial I will be using ubuntux as my main computer where I install Postfix. 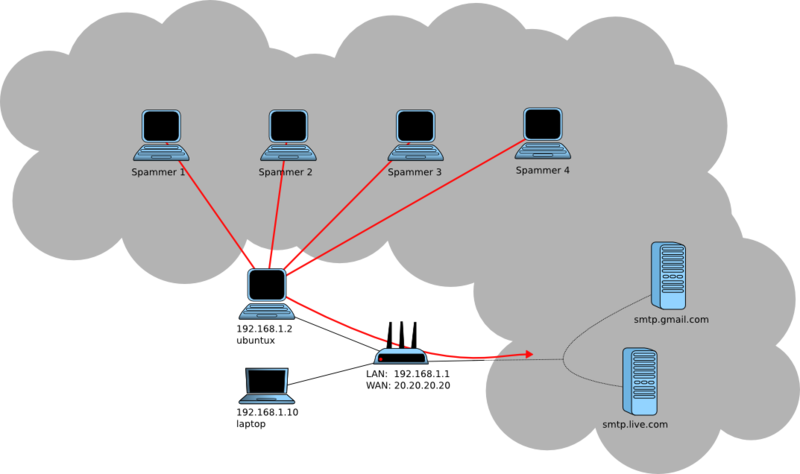 If you haven’t read my article on sending emails via telnet, you could check it out. In that article I describe how you can use telnet to send emails via a gmail mail server. To send our emails we will be using telnet like in that article. The only difference is that while we had to authenticate with the gmail server with a login/password, here we won’t. The reason is that our mail server is in the LAN and by default configuration users in LAN are considered trusted. In the telnet session I sent an email to animal@localhost. We assume that animal is the user I am logged in as at the moment. Then I can just type mail in the terminal and I will see the email arrived. Typing the number of the email I can read it. Typing ‘q’ will quit the application. All emails can be found in their raw format at /var/spool/mail. The recipient after “RCPT TO:” can essentially be any user (existing or not) as long as the domain used in the email is the hostname of our mail server (ubuntux in this case). An email with a different domain could be for example animal@randomdomain. The email with such a recipient would get totally discarded from the server and lost. (1) As seen in the illustration the mail server looks at the domain after the ‘@’ symbol in the recipient of the email. linuxmeerkat.com. IN	MX	10	mail.linuxmeerkat.com. Since the mail.linuxmeerkat.com hostname (or FQDN to be exact) doesn’t exist, we have to create it with an A record. An A record binds a (made up) hostname to an IP by definition. 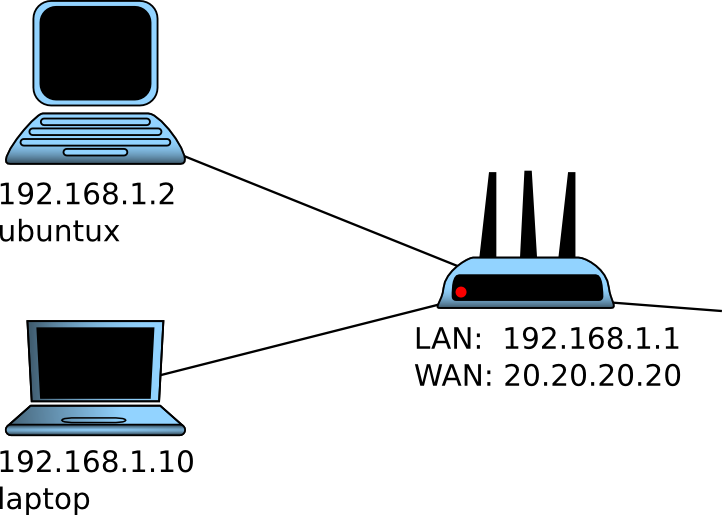 Since our server is behind the router I use the IP of the router instead (the IP should never be a LAN one). For hostname I use mail but you could use whatever you wish. Just keep in mind that if you change it, the hostname must also be reflected in the MX record – you should also change the FQDN. When we ping mail.linuxmeerkat.com we want that it pings 20.20.20.20. So let’s test it. Go to http://ping.eu/ping/ and ping your mail server’s FQDN (in this case mail.linuxmeerkat.com). It’s important that you ping from outside your LAN so that no local cache is used. If you don’t get a response, try pinging directly your WAN IP (20.20.20.20). If you still don’t get a response, then probably your router is blocking ping from outside. If you are getting a response by pinging the IP but not when you ping the hostname, then you haven’t configured your DNS records correctly or they haven’t taken effect yet. Since we know that mail servers use port 25 and if we haven’t changed that, then our mail server also uses port 25, we just have to configure the NAT of our router. If we can ping the mail server from the internet, then we can assume that our network is reachable. 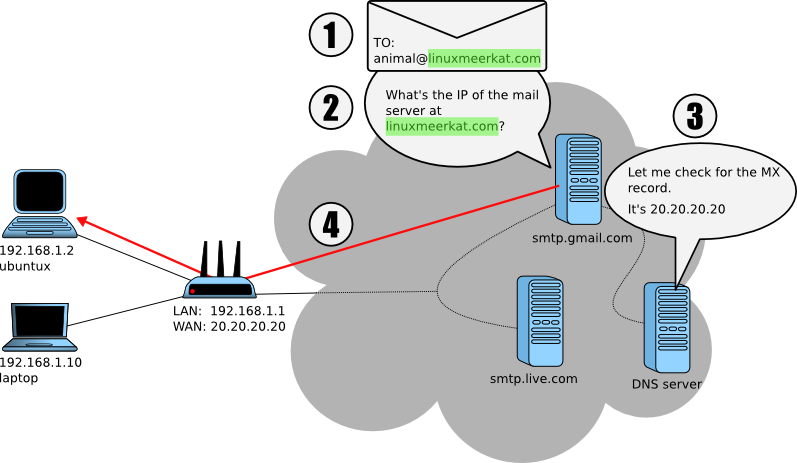 Sending an email to animal@mail.linuxmeerkat.com will not work still though as the router won’t know to which computer in the LAN to forward the email to. 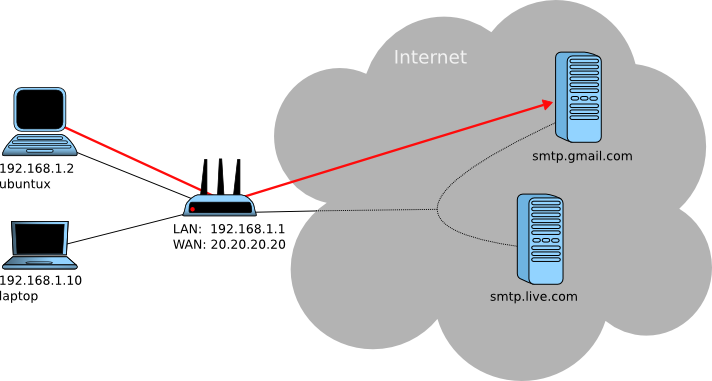 Setting the NAT of the router to forward all incoming TCP connections on port 25 to the mail server fixes this. mydestination is the variable that defines what FQDN/domains in emails are accepted. In essence all emails arrive at the server, it’s just the depending on this configuration some of these emailes will be discarded and some will be accepted by the server. With the current configuration we can see that only emails of the format username@megistanas and username@localhost are accepted. Trying to send an email to animal@ubuntux from gmail won’t work as ubuntux just can’t be seen from outside our LAN; it doesn’t resolve to anything. For this reason we want to add one ore more domains that point towards our network. That way, when the an email arrives it doesn’t get rejected. mynetworks specifies local networks where users are considered trusted to use our mail server. For that we have added the 192.168.0.0/16 which includes all computers in the network. Be careful, you don’t want to have a WAN ip here as that would make our mail server an open relay (I talk more about that below). Our mail server works fine at the moment but it’s very minimal. It doesn’t even filter incoming spam emails. Configuring filters etc. can be time consuming and will need further maintenance all the time. An easy solution to this is to forward our emails to a second mail server, a relay server (keep in mind: not same as an open relay, as a relay server is not open to everyone). So if we have to deliver an email to user11@gmail.com, instead of delivering to the gmail server directly, we can use a second mail server which we have access to. That server can then do the filtering etc. for us and deliver the email to its final destination. My ISP is called Bahnhof and by googling around I found that it offers a relay at mail2.bahnhof.se. Most ISPs do offer mail servers that can be used as relays. Luckily for me, I don’t even need to enter a password and username as I am authenticated by my IP or MAC (depends on how you’re connected to the ISP). In your case you might need to authenticate first before using the relay. I won’t go into how you do that. I will however tell you how you can test to see if you can use the relay as a relay server. I just connected to my ISP’s mail server and sent an email to a gmail account. Since I got the email delivered and wasn’t asked for a login/password, that means that I can directly use the server as a relay without authentication. Categories: DNS, Networking, Protocols, SMTP, Telnet, Terminal, Uncategorized | Tags: Gmail, LAN, mail exchange, mail server, MX, postfix, SMTP | Permalink. In practise this method is being used to test things. If you are developing a web-server for example it would be easy if you could test your web-server directly without having to launch a browser and type a command. It’s a blessing for automation. The flag -z ssl tells telnet to use SSL over the connection. smtp.gmail.com is Gmail’s server domain and 465 is the port used by the server. For gmail it doesn’t really matter who you set as sender. We logged in our gmail account when we sent the AUTH LOGIN message to the server. Gmail has as a mechanism to set the sender automatically to your email address. Now we will add the recipent of the email. Here we need to provide a valid email or else the email will not go any further. If the email doesn’t exist, we will probably get it back into our inbox which is the default behaviour for undelivered emails. Something important, as mentioned in the beginning of this page, is that encoding data to base 64 is not encryption but rather a different representation of the same data. It’s SSL which adds the encryption to our communication and you can be assured that everything is encrypted between the client and the server. After we get the domain we do a first handshake with the mail server. It’s those three TCP messages with SYN/ACK in them. After that we initiate a TLS session. TLS and SSL are pretty much the same thing. They are just different versions for encrypted communication, with TLS being the newer one. Everything we type and read from the time we start telnet is encrypted. The reason we see the messages clearly in the terminal is that they get decrypted by telnet on their arrival. When messages leave telnet, they get encrypted to travel on the wire. That’s why with Wireshark we only see the decrypted data, because we are looking at what is passing through the wire. I circled the TLS messages to make it more apparent that the whole session is encrypted by using TLS. The few TCP packets seen here and there, are packets with encrypted data. 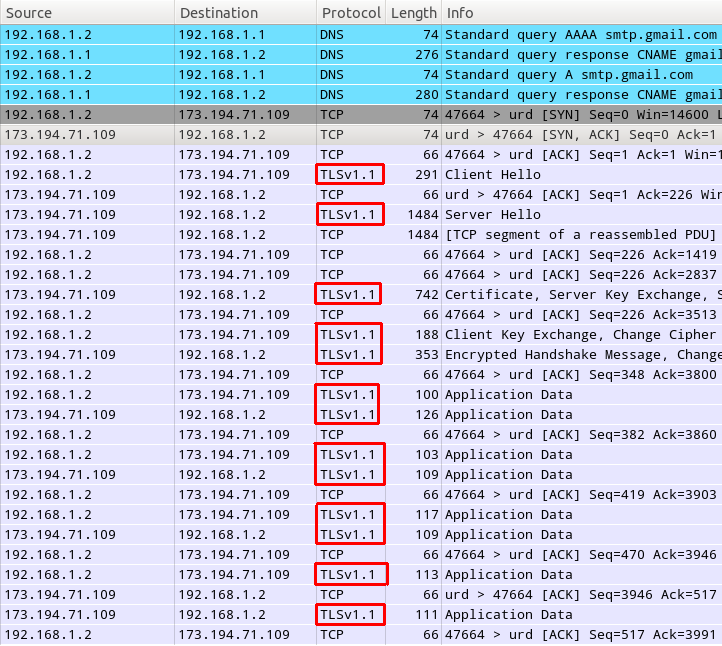 If you could check what these packets hold inside(with Wireshark), you would only see gibberish. If instead of Gmail we were using an SMTP server that doesn’t use SSL, we would be able to intercept all the packets with their raw data, and thus the actual messages, passwords, usernames, etc. Categories: Networking, Protocols, SMTP, Telnet | Tags: Gmail, hacks, SMTP, SSL, Telnet, telnet-ssl, TLS | Permalink.